The Australian Centre for Christianity and Culture wishes to pass on its condolences to the family and friends of John Miller. He passed away surrounded by loving family and the caring wonderful staff of Banksia Lodge, Broulee. He was cherished husband and soul mate of wife Lomond ( dec ). Exceptional unique father and friend of daughters Michele and Peta and their partners, John and Warwick. Loved and always called 'John' by his granddaughters Peta, Katrina, Alex and Ash and his great grandchildren Georgia, Molly and Declan. His service was held at St Johns Anglican Church in Moruya on 7 December 2018 and was conducted by Reverend Linda Chapman, a spiritual companion. 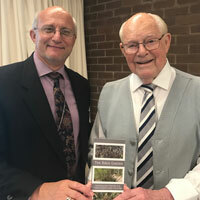 John Miller was a generous donor and supporter of the work of the Australian Centre for Christianity and Culture and in 2016 he wrote The Bible Garden which was officially launched in 2017. In an article in The Canberra Times in 2017 he explained how the idea for the book came about out of a desire to have a documentation of the plants from the garden together with bible passages. Executive Director of the Australian Centre for Christianity and Culture Rt Rev’d Stephen Pickard said John Miller’s book was a generous contribution to the work of the Centre and had been purchased by many people. The Bible Garden book is available to purchase from the Centre for $20. Contact us to purchase a book.